Asphalt is an incredibly durable material. After all, any pavement that can withstand the heavy traffic on roads and parking lots must be remarkably strong, right? While it’s true that asphalt is an amazingly tough material, it’s not indestructible. In fact, you may be surprised to learn that one of the most common ways in which asphalt is damaged is by the landscaping that is adjacent to the pavement. Whether your asphalt is a driveway, walking path, or commercial parking lot, here are a few tips to help prevent your landscape from damaging your pavement. Avoid planting trees too close to your asphalt surface. Roots of trees often cause pavement to buckle and crack. No matter what size the tree is, its roots can extend out several feet. So be sure that any trees you plant are a significant distance away from your asphalt surface. And plan ahead. Ideally, your asphalt pavement will last for many years, so imagine how big the tree will become as the years pass, and plant it far enough away from the pavement so that the tree can have room to grow without impacting the asphalt. Minimize exposure to water. Water can cause significant damage to asphalt. Most paving contractors recommend seal coating periodically to protect asphalt surfaces from absorbing too much rainwater. Considering how susceptible your pavement is to water, why expose it to even more moisture from sprinklers or drip systems? Make sure your irrigation is kept as far away from your asphalt surface as possible, and that sprinklers are always pointed away from your paved surfaces. Your pavement should also have adequate sloping so that water can drain off the surface rather than being absorbed into the pavement. 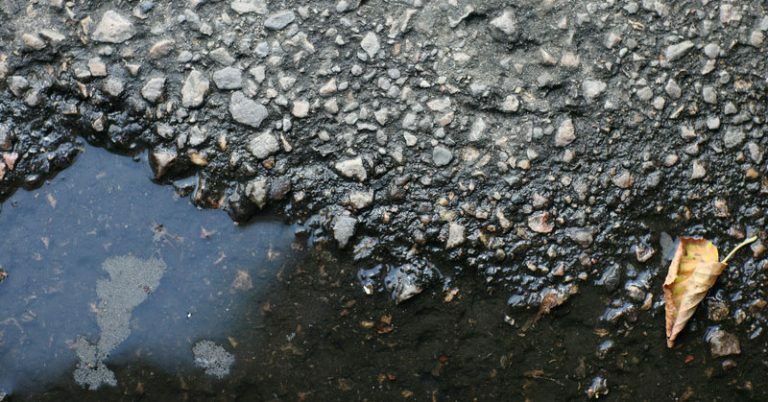 If water is allowed to sink in, it can damage the base layer of the asphalt, causing it to sink and form potholes. Keep fertilizers away from asphalt. Although most fertilizers won’t damage the structure of asphalt, some types can stain paved surfaces and even erode the seal coating that is designed to protect your asphalt. To learn the best ways to protect your pavement, contact a local paving contractor. In addition to preventing damage caused by adjacent landscaping, you should keep your pavement as clean as possible and add a layer of seal coating periodically as an added measure of protection. A local paving professional will best understand your climate and can recommend other precautions you should take to protect your pavement investment.